During this special event, attendees will have the opportunity to hear each candidate or their representative briefly address why they are the best candidate for up for office. 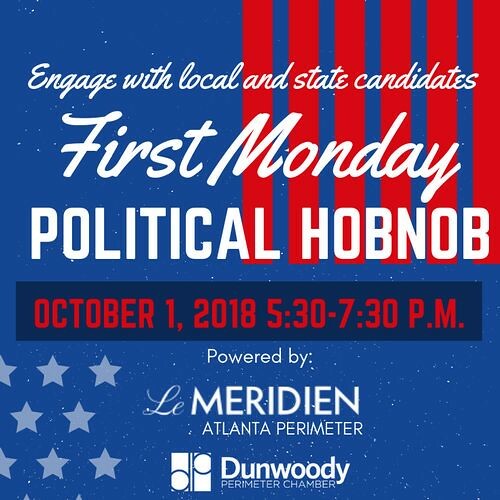 Attendees will also get the opportunity to network with the candidates as well as other business leaders throughout the Perimeter Market while enjoying wonderful appetizers and cocktails at one of our member locations, Le Meridien Atlanta Perimeter. *Remember to bring an abundance of business cards & get your social on by using #DPCFirstMonday. *Advance Registration will end at 1pm the Friday prior to the event. Sponsorship opportunities are available for this event. Please click here for information - additional sponsorship information which may be of use may be found here. You may register for these by clicking the register button on this page. This happens every Wednesday across the street from Peachtree MS.
As a Peachtree Charter Middle School parent, I received an email from Principal Donnie Davis which brought a smile to my face as I love this proposed connection between the school and the community. Not everything to be learned can be received in a classroom therefore my sons application will be turned in this week. Peachtree Charter Middle School would like to invite you to partner with us and St. Patrick's Episcopal Church, to emphasize the importance of community service and giving back. Beginning Wednesday October 10th, 2018 thru March 30th, 2019 7th and 8th grade students have an opportunity to volunteer at Malachi's Storehouse, packing and distributing food and other items to those in need. Students will be allowed to volunteer during their connections classes on Wednesdays. Once a month PCMS will conduct collection drives for toiletries, diapers, hygiene kits, new socks, underwear and clothes which will be donated to Malachi's Storehouse, The City of Refuge and The Atlanta Women's and Children's Shelter. MJCCA Book Festival brings big names to Dunwoody - tickets are going fast. Plus 35+ more of the year’s most celebrated authors! 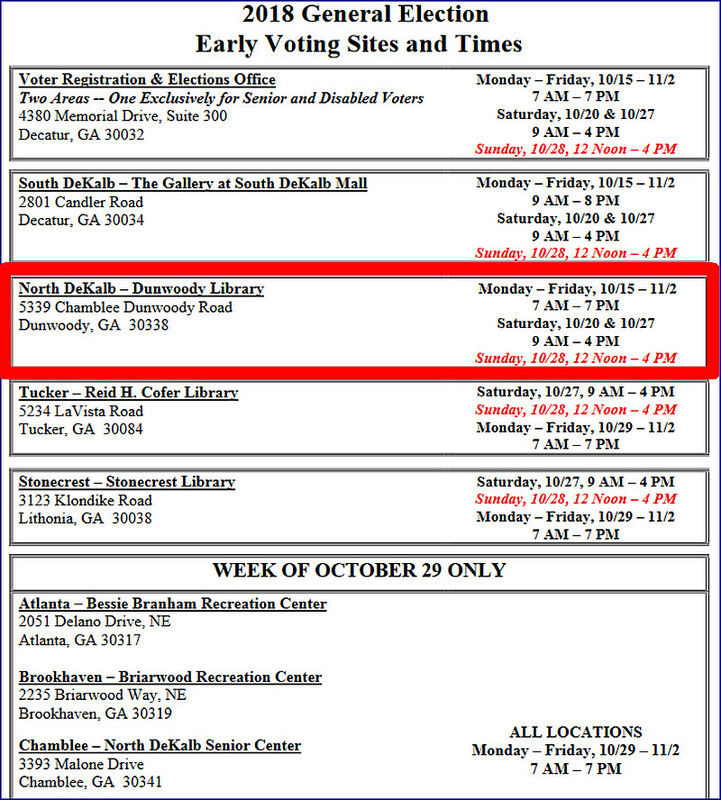 Early voting at the Dunwoody Library starts October 15th and runs for three weeks. Pedestrian path and bridge connecting Perimeter Center to Georgetown. Related items from the past. P.S. - there is also a 5 pm Special Called Meeting which lists an Executive Session "for the Purpose of Personnel Discussion" - nothing interesting there. 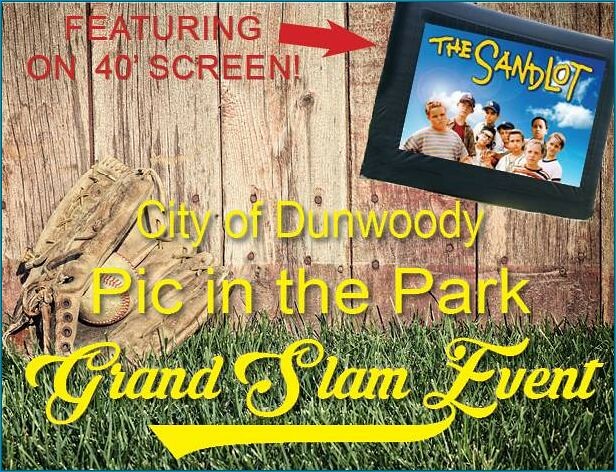 Dunwoody's Pic in the Park Grand Slam Event on Saturday featuring the move "The Sandlot"
Take yourself out to the ball game at Dunwoody’s Pic in the Park Grand Slam Event at the new Brook Run Park baseball fields (4664 Barclay Drive) Saturday, September 22nd at 6:00 p.m. There will be food and festivities including a ribbon cutting, an inaugural first pitch, beverage and popcorn carts and giveaways! The movie will feature ‘The Sandlot’ (PG) shown on at 40’ screen at dusk, so bring your lawn chairs blankets and don’t strike out on this great event! Unfortunately pets will not be allowed at this event. 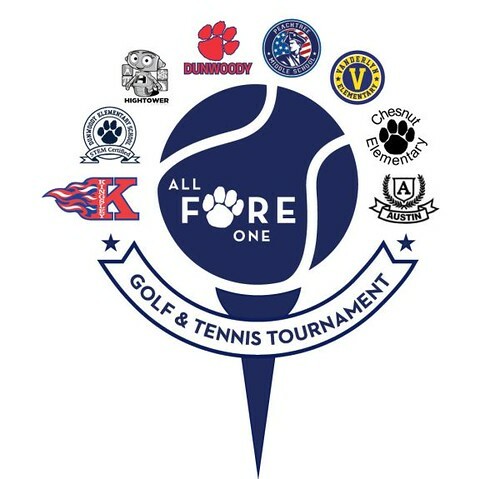 All Fore One Dunwoody community golf & tennis tournament: benefiting capital improvements and educational enrichment at Dunwoody High School and Peachtree Charter Middle School. This year proceeds will be directed to the high school to assist with their efforts to enhance the high school athletic facilities. Learn what “The Bases are Juiced” means! Take part in the fun and productive way of preparing for the upcoming spring season!Get 4 or more at-bats per game, hit home runs, and stay sharp even if it’s snowing outside! All games are played on Sundays. If you want to “play like a winner,” Indoor Baseball is the best start! If you are ages 6-12+, this is your chance to be a part of it. Please ask anyone who ever played indoor! The league is limited to 72 players; so sign up TODAY! Dunwoody Police Department will be participating in the National Prescription Drug Take Back Day on Saturday October 27, 2018 from 10:00 a.m. to 2:00 p.m. The National Prescription Drug Take Back Day addresses a crucial public safety and public health issue. According to the 2015 National Survey on Drug Use and Health, 6.4 million Americans abused controlled prescription drugs. The study shows that a majority of abused prescription drugs were obtained from family and friends, often from the home medicine cabinet. The DEA’s Take Back Day events provide an opportunity for Americans to prevent drug addiction and overdose deaths. 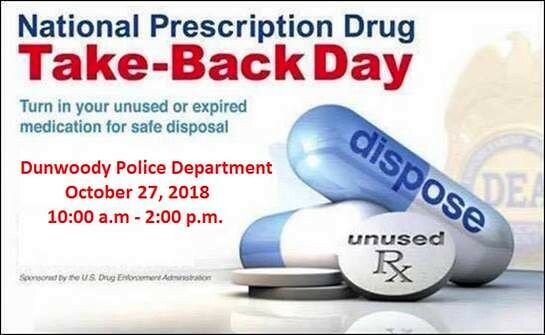 Stop by Dunwoody Police Department on October 27, 2018 from 10:00 a.m. to 2:00 p.m. to drop off expired, unused, or unwanted prescription drugs or over-the-counter medication. We cannot accept needles/sharps, syringes with needles, thermometers, IV bags, bloody or infectious waste, personal care products, empty containers, inhalers, medical equipment and hydrogen peroxide. Disposing of all expired, unused, and unwanted medications is an important way to keep your family safe. If you have any questions about this event, please contact Community Outreach Officer Anwar Sillah at anwar.sillah@dunwoodyga.gov. This Yellow Dot available around Dunwoody could save your life. Give the first responders the information they need to assist in your time of need. The Dunwoody Police Department is pleased to introduce the Yellow Dot program to our community. Yellow Dot is a free program designed to help first responders provide life-saving medical attention during the first “golden hour” after a crash or other emergency. The Yellow Dot program will help first responders understand important information about a patient’s medical history when arriving to an emergency scene. A yellow, peach-shaped decal placed on the driver side rear window of a vehicle will alert first responders that vital medical information is stored in the glove compartment. The decal can also provide life-saving information to emergency personnel responding to in-home emergencies. At the homes of participants the Yellow Dot will be placed at the entrance. 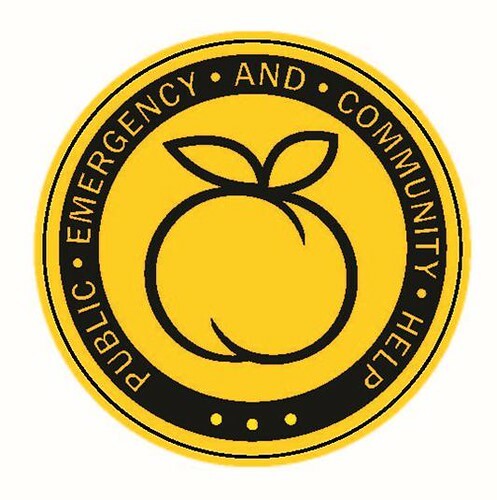 First responders arriving at the scene of an emergency will be alerted by the Yellow Dot decal to look for the medical information card in the glove compartment or on the refrigerator. The Dunwoody Police Department, 4800 Ashford Dunwoody Road, Dunwoody, GA 30338. 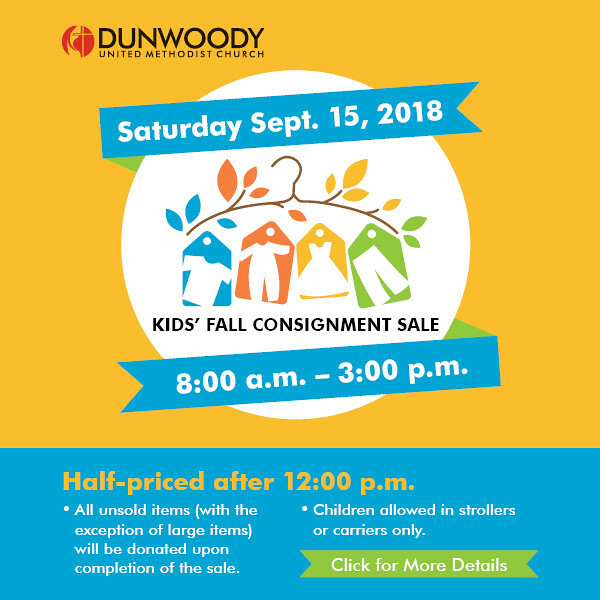 The Dunwoody Library, 5339 Chamblee Dunwoody Road, Dunwoody, GA 30338. The Phoenix at Dunwoody, 4484 N Shallowford Road, Dunwoody, GA 30338. The Alzheimer's Association, 41 Perimeter Center East, Suite 550, Dunwoody, GA 30346. 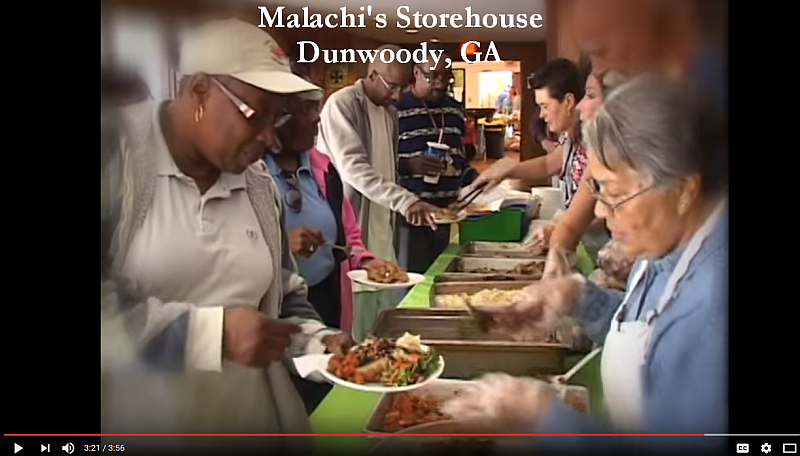 The Marcus Jewish Community Center of Atlanta, 5342 Tilly Mill Road, Dunwoody, GA 30338. The Yellow Dot program being brought to Dunwoody is the result of a partnership between the Georgia Department of Human Services Division of Aging Services. More information regarding the Yellow Dot program is available at https://aging.georgia.gov/yellow-dot-program. Frequently Asked Questions on Yellow Dot from initial (Laurens County) Program. Saturday, September 15: Open to the Public 8:00am to 11:30am; Half Price 12:00 to 3:00pm. 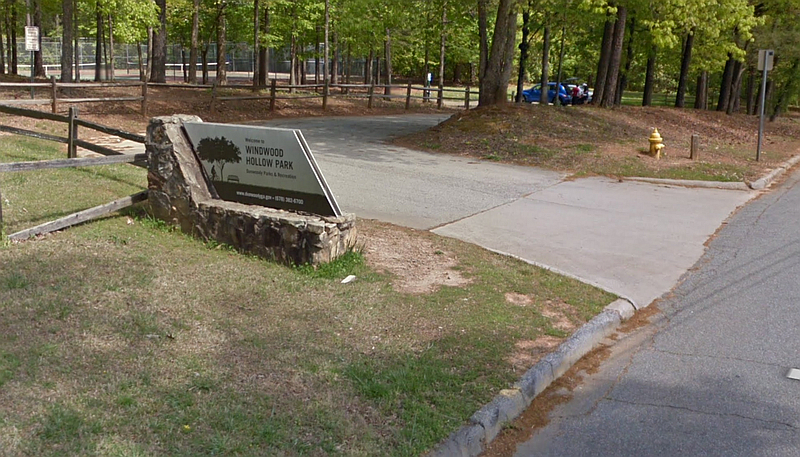 The City of Dunwoody moves forward with EcoClassroom project for the Dunwoody Nature Center. 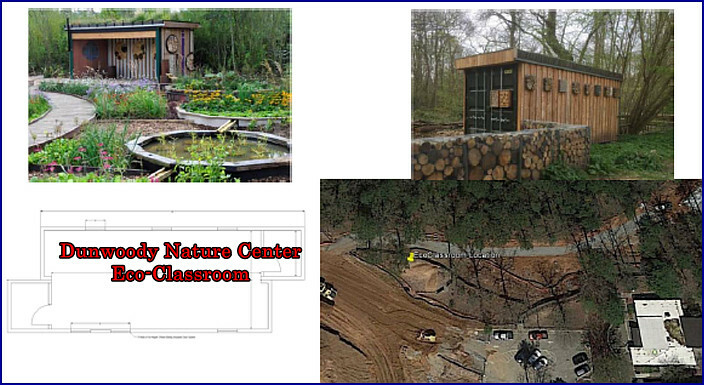 The Dunwoody Nature Center EcoClassroom will serve the needs of both the Nature Center’s current and future program users while providing additional public gathering space. For the sixth consecutive year, the Nature Center achieved record numbers of park users and program participants in every single documented program area with 17,406 program participants and more than 27,000 facility users. The desired sustainable design of the EcoClassroom will greatly alleviate facility concerns while allowing for simultaneous programming across user groups. It will also serve as an environmentally friendly example of repurposing shipping containers to achieve a desired effect. A sustainable container building will be used, in keeping with the Nature Center’s mission, and will occupy unprogrammed space adjacent to the front entry/parking lot area just west of the recently created micro pool stormwater system. The building will serve the community by offering meeting space for Boy and Girl Scouts and other civic organizations, as well as programming space for field trips, camps, classes and birthday parties. The EcoClassoom will utilize a sustainable design featuring two shipping containers that will be built together to create a 450 S.F. enclosed meeting space for these user groups. The quote provided includes the full build out of the EcoClassroom Below are examples of refurbished shipping containers and the desired footprint and location within the park of the containers for this project. 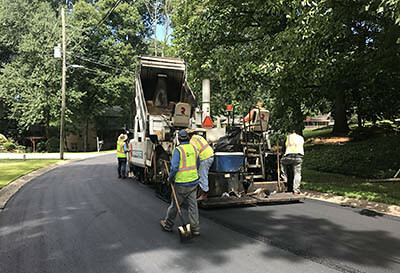 Construction crews are scheduled to begin paving operations on Womack Road (from Tilly Mill Road to Chamblee Dunwoody Road) beginning Sunday evening, September 16th. The paving work will occur overnight between the hours of 8:00 PM and 6:00 AM Sunday thru Thursday, weather permitting. The overnight paving work and continuous operations allow for expedited project delivery. The expected total duration of the paving project is anticipated to last seven to 10 nights, weather permitting. Travel delays and lane closures can be expected during the work period and crews will be on hand to ensure safe passage through the construction area. Motorists are encouraged to plan ahead and select alternate travel routes to avoid these areas during the active overnight paving operations. Windwood Hollow Park located just off Peeler Rd near the DeKalb Waterworks is a hidden gem of a park, offering a playground in a wooded setting, tennis courts and pavilion. 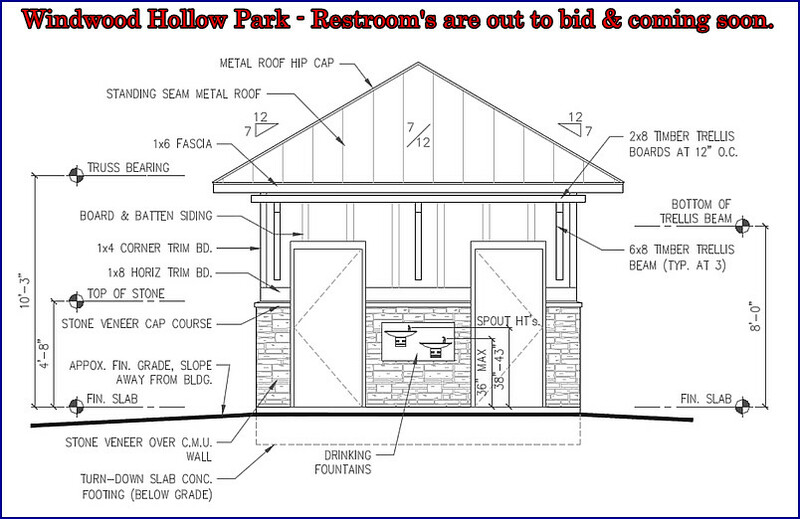 The bids for new restrooms are on the street and I anticipate that this new amenity will be built within the next few months. Upon reviewing the parks amenities with a resident it was pointed out that this park has no dedicated sidewalks into the facility whereby parents are forced to walk in the street with children especially when bicycles and strollers are involved. This morning I pointed out this fact out to the budget committee (Pam Tallmadge, Jim Riticher and myself) and we reallocated funds to correct this this item and/or plan for a large scale trail from Peeler through the park. Overall the budget meeting this morning started at 9:30 and ended just before 2 p.m. whereby we went over every line item, asking questions and understanding Dunwoody financial position. We made a few minor tweaks improving pedestrian safety funding and set the ball into place for major park improvements. The full budget will be brought in front of the community within the next month and then it will be voted upon by the full council. 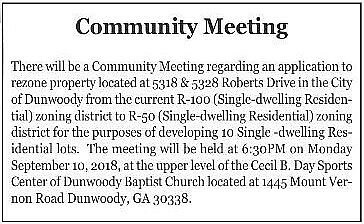 Rezoning informational meeting Monday Night for Roberts Drive property across from new Austin Elementary. 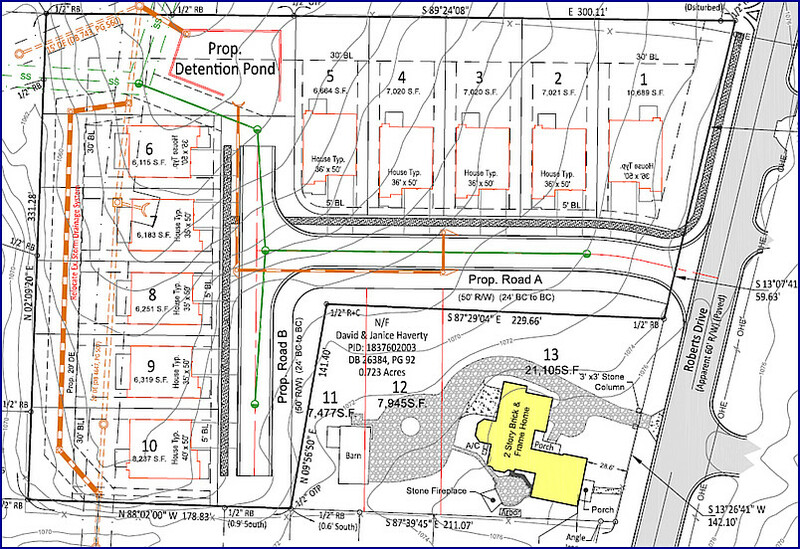 Looks to be requesting ten houses where there are now two and the property is located almost directly across from the new Austin Elementary Bus access lane. Meeting Monday Sept 10th - 6:30 pm at the upper level of Cecil B. Day Sports Center of Dunwoody Baptist Church, 1445 Mount Vernon Rd, 30338. I also saw that the developer will be visiting the DHA meeting next Sunday to make their pitch to the community. Dunwoody City Council agenda for Tuesday September 11th - Is Dunwoody Senior Baseball getting a sweetheart deal renting our park land? Presentation and Adoption of PIB Small Area/Market Study (Richard McLeod). Usage Agreement With Dunwoody Senior Baseball to over schedule excluding local usage? 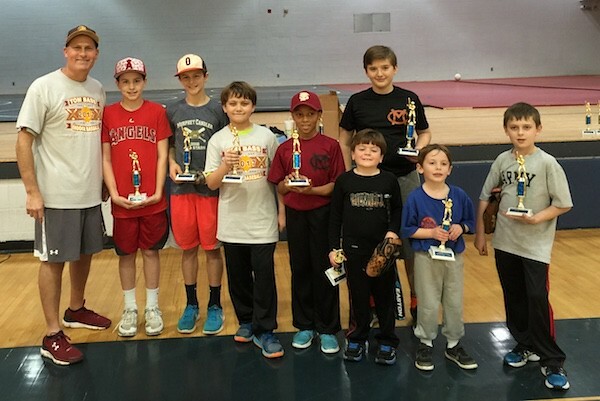 The City of Dunwoody spent $7 million dollars purchasing land and improving facilities so that local area boys could continue the sport of baseball once they age out of Murphey Candler Little League continuing on through high school. This is city property and it should be able to be used by a wider range of Dunwoody residents not just rented out to area baseball programs and weekend tournaments to the highest bidder in order to maximize revenue to the Dunwoody Senior Baseball Program. Tuesday night City staff is presenting the city council with a use agreement whereby there may be no time available to schedule organized girls softball, recreational softball leagues, soccer, lacrosse, rugby or just open play. These are city fields and I want the core function of Dunwoody Senior Baseball allowing teenage boys a place to play to flourish but this should be done in conjunction of a many other uses too. 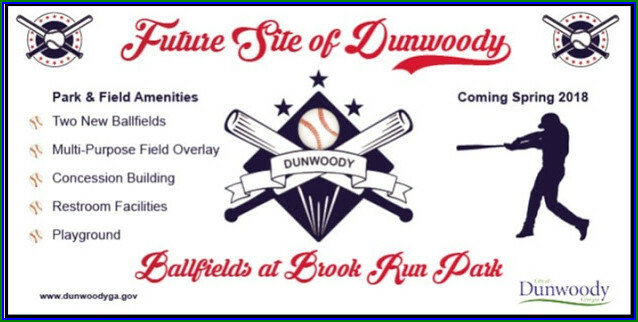 These are not "Dunwoody Senior Baseball's Fields" they are the "Ballfields at Brook Run Park" therefore I have concerns on the proposal being presented. The new baseball fields, located between Peachtree Charter Middle School and Brook Run Park, cost the city about $7 million to build and include artificial turf. The two fields are busy with league and tournament play, but some City Council members are questioning their openness to general public use. The ball fields, owned by the city and managed by DSB, opened earlier this year. DSB President Jerry Weiner gave the mayor and City Council an update on the new fields at the Aug. 27 council meeting, saying the fields have attracted national attention from leagues throughout the Southeast. For example, Perfect Game USA, an amateur baseball league based in Iowa that boasts on its website it is “the world’s largest baseball scouting service” for colleges and Major League Baseball, held tournaments at the fields from June through August, Weiner said. Teams from across the eastern U.S. came to Dunwoody to play with about 300 people per day at the park. Another baseball league, Triple Crown Sports based in Georgia, brought in 500 people over a weekend in June and will bring in more players and fans in September through November, he said. But Councilmember John Heneghan said it may be time to put a public calendar in place through the Parks and Recreation Department to allow local residents time to use the fields for recreational soccer, softball or kickball leagues. Rotary Club of Dunwoody’s BBQ fundraiser at Perimeter Mall is being held this coming weekend, Sept 7th & 8th. Party at Perimeter Mall this weekend. 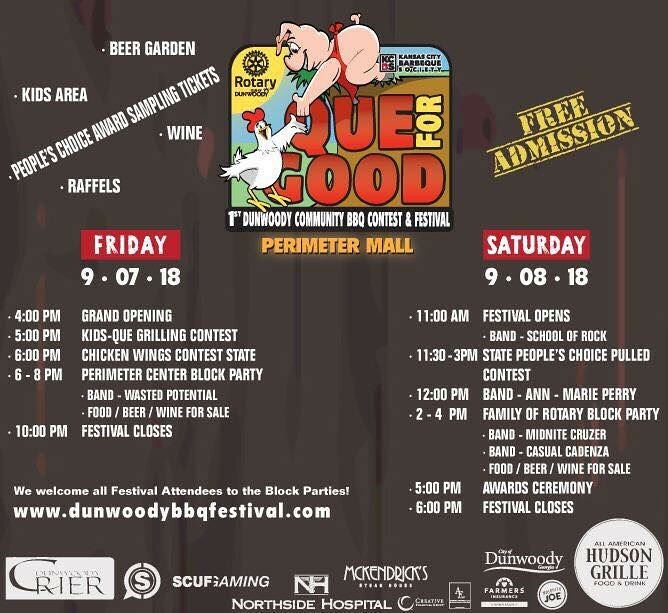 Come cook, eat, drink & listen to music and if you are interested in assisting the Rotary Club of Dunwoody there are volunteer slots available too. 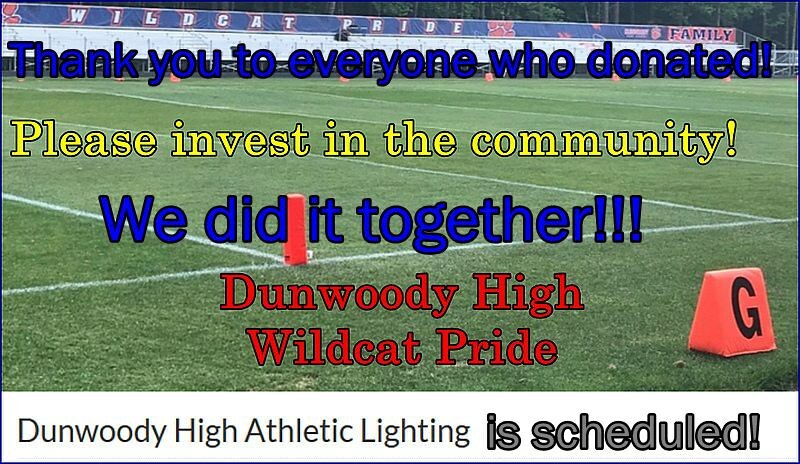 Game On capital campaign for Dunwoody High School athletic facilities would like to Thank everyone who donated, as there will now be lights on the field. Again, thank you! We will get the ball rolling this week to schedule light installation as soon as possible and will inform the community once we have specific dates. Please note that we are not finished! The Game On! campaign will continue raising money to light up the softball field, add concession/bathrooms and home seating! Self driving cars? Yeah.... No Thanks! 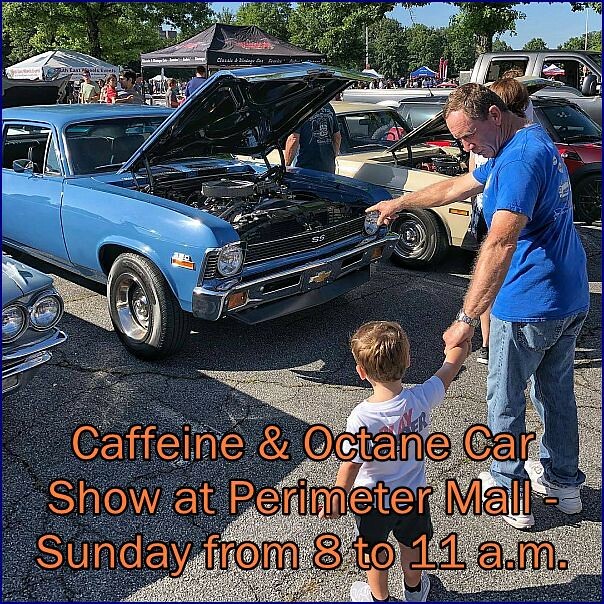 The largest monthly car show in North America is held the first Sunday morning of each month at Perimeter Mall in Dunwoody GA. 8am-11am. 2,500 + cars and 15,000+ fans visit each month. Free to attend and Free to exhibit. Watch the Caffeine & Octane TV Show on the NBC Sports Network.